CARBON REMOVER is a heavy duty, concentrated cold, solvent degreaser specifically designed to remove oil, grease, wax, dirt, moisture, tar, and other contaminants instantly and without wiping. It leaves a residual rust inhibiting film thus protecting metal surfaces from future corrosion. CARBON REMOVER is a super cleaner ideal for use on all types of industrial machines, tools, marine, and automotive engines. 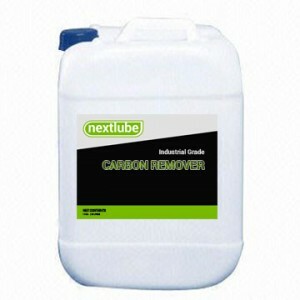 CARBON REMOVER is non – flammable, non – corrosive and bio – degradable. CARBON REMOVER is water soluble. CARBON REMOVER contains no phosphorus. CARBON REMOVER is effective on all kinds of dirt, grease sludge, oils and carbon deposits. CARBON REMOVER fast – acting formulation saves time and money. 1. Heavily soiled motor engines, engine parts, fittings, mechanical equipments and kitchen appliances – use as pure concentrate to 1:5 depending on the degree of soiling. 2. Garage floor, soiled surfaces and as windshield wiper cleaner – add 1/2 cup to a gallon of water. 3. Daily cleaning – 1:10 to 1:30 dilution with water. CARBON REMOVER is an efficient cleaning and degreasing agent for automotive, aircraft, marine engines, mechanical equipments, instruments, tools and machineries. CARBON REMOVER is available in Gallons of 4 Liters, Pails of 20 Liters, Jugs of 30 Liters and Drums of 200 Liters.